OSHA (Occupational Safety and Health Administration) is an agency of the U.S. Department of Labor. OSHA was created by Congress in 1970 and sets and enforce rules and regulations that protect workers against unsafe or unhealthy working conditions. OSHA requires all employers to keep their places of work free from known hazards that could cause injury or death to their employees. Regulations set by OSHA are known as standards. – National Consensus Standards. These are health and safety standards created by multiple private agencies. The standards the U.S. Secretary of Labor has set for workplace safety have been adopted by OSHA. Regulations established by the American National Standards Institute (ANSI) are examples of National Consensus Standards. Rules set by the American Society for Testing and Materials (ASTM) and National Electrical Contractors Association (NECA) are other examples of National Consensus Standards. – Proprietary Standards. These are standards created by experts in their respective fields. Regulations adopted by the Association of General Contractors (AGC) and the National Fire Protection Association (NFPA) are good examples of proprietary standards. – Pre-existing Federal Laws. These are laws that were enacted before OSHA was created. An example of a pre-existing federal law is the Walsh-Healy Act. Its purpose is to set health and safety standards for government contracts valued at more than $10,000. Another example is the McNamara-O’Hara Act that requires employers to pay workers’ wages and benefits that are least as much as the usual rate in the area. The Construction Safety Act that regulates working hours and safety standards in construction contracts. The Construction Safety Act is also a pre-existing federal law that is enforced by OSHA. The majority of standards OSHA enforces are horizontal standards. Horizontal standards are also known as general standards because they apply not just to specific industries, but to all industries in general. All businesses have to obey horizontal standards, regardless of the industry sector. Vertical standards, however, apply only to specific industries. More about vertical or particular standards that are specific to different industries later. Horizontal standards cover a wide range of potential workplace hazards. Fire protection, floor and workstation surfaces, and first aid are some of the topics covered. An example of a horizontal standard is the Hazard Communication Standard (HCS). The purpose of HCS is to ensure that all employers and employees can recognize and are aware of the potential dangers of chemical substances you can find in the workplace. HCS also talks about the precautions workers can take to avoid contact with dangerous chemicals and other substances. Interestingly, OSHA doesn’t consider scissor lifts to be a type of aerial lift. They’re classified as scaffolds, and are covered under separate horizontal standards. OSHA horizontal standards require all aerial lift operators to be properly trained and certified. The training and certification of workers is the responsibility of the employer. Not complying can result in large fines. Serious breaches can also include prison time. The fastest, most convenient and best way to avoid OSHA violations is to certify operators through CertifyMeOnline.net’s online OSHA-approved training program. OSHA vertical standards, which are sometimes called particular standards, apply only to specific industries. Examples of industries for vertical standards include longshoring (loading and unloading cargo from ships), construction, sawmills, and telecommunications. Interestingly, there are no vertical standards for oil and gas exploration and drilling. For a complete list of special industries that fall under OSHA vertical standards, check Subpart R of Code of Federal Regulations (CFR) 1910. Most, if not all, of these industries involve the use of aerial lifts in everyday operations. This makes them subject to OSHA vertical safety standards. When there’s a vertical standard that applies to a certain industry, the vertical standard takes priority over horizontal standards. As with industries covered by horizontal standards, it’s the responsibility of the employer to see that all operators are properly trained and certified. In addition to aerial lift operator training, CertifyMeOnline.net also offers OSHA approved online Aerial Lift Safety Training courses. Our training courses are designed to comply with OSHA vertical standards and horizontal standards. They make an ideal foundation of skills and knowledge for beginner aerial lift operators, veteran scissor lift workers, and everyone in between! CertifyMeOnline.net is the leading online aerial lift training specialist. Since 1999, we’ve trained thousands of clients. CMO also provides safety training online. Our courses are fast, convenient and affordable. Training can be completed in as little as an hour. All materials are available online 24/7, so courses can be taken using a smartphone, tablet or similar device anywhere there’s an Internet connection available. To learn more about OSHA-approved Training, speak with one of our safety experts at 888-699-4800 or contact us online today! Are you prepared to handan on OSHA inspection? What are the main parts that make up an OSHA inspection? And what about fines and penalties? You have questions, and we have answers! An OSHA inspection can be stressful for any company, especially if you don’t know what to expect going in. The OSHA compliance and training experts know what to expect. We’ve been involved with audits and inspections, and we also know how to help your company prepare accordingly. These inspections can relate to OSHA vertical standards (industry-specific regulations) and horizontal standards (more broad-based safety guidelines). Regardless of your company’s work activity, it helps to know how to prepare for an OSHA investigation. 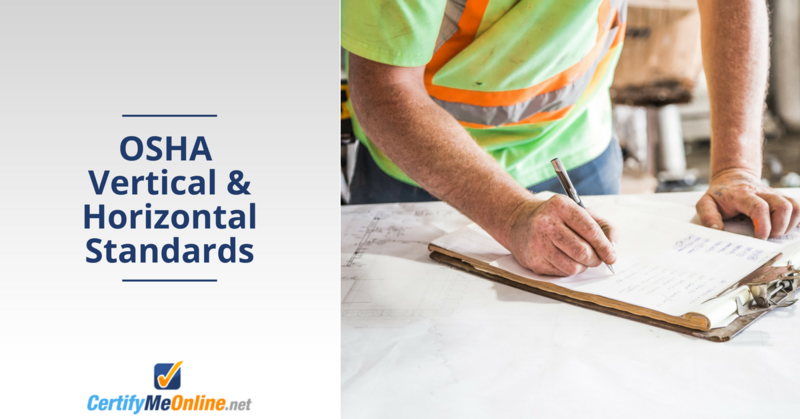 Get up to speed with OSHA vertical standards and inspections with today – check out our informative post! Your aerial lift tasks probably differ from other users, but did you know that aerial lifts are literally used for hundreds of different reasons on a daily basis? We look at ten different industries and jobs that make good use of aerial lifts every day, and some might surprise you! Some of the industries are subject to OSHA vertical standards, since the type of work is so specialized, while others are more general. Did you know that college football teams use them to improve safety and security? Or that aerial lifts are used by amusement parks to maintain and repair rollercoasters (now there’s an OSHA vertical standard with a certain fun factor)? Check out this informative blog post today, and learn about all the cool uses for aerial lifts!